I am sure I felt an earthquake just now. In Manilla, NSW, in a house on a concrete slab on bedrock. Time 21:31 EST, 8 June 2012, two sharp shocks 10 seconds apart, with shaking fading over several seconds. Time 21:33 EST, 8 June 2012, two sharp shocks 10 seconds apart, the second one stronger, with shaking fading over several seconds. The house shook, and double-glazed windows rattled. I tried to access Geosciences Australia's earthquake reporting website, but got: "The connection to www.ga.gov.au was interrupted." The epicentre plots near "Manilla Ski Gardens" at the north end of Lake Keepit, but I see that the Uncertainty of Location means it could be right here at Manilla. The shocks were very sharp, like a truck running into the house. 2 distinct shakes in Tamworth, about 30 secs apart. House shook, rumbling noise like a train and every dog in the neighbourhood howling. No damage but instant reminder of Newcastle when I was tossed out of a bed in Woolongong!!!!! The two shocks were 13 seconds apart, when I had guessed 10. And the second set was not quite two minutes later. 4.3! That's a fair shake. Uni friends in Armidale and Tamworth are saying they felt the earthquake. Never felt an earthquake before, makes me wish I was still up there just to experience it. Enough of a shake to head outside!!!!! Relatives at Barraba felt the quake, and two friends in Uralla felt it as well. From your report Orion and from others I know in Tamworth, it sounds like it was a fairly unsettling experience. Some were not keen on going back to bed. EMERGENCY services were inundated with calls last night as an earthquake shook a large section of the North West. The 4.2 magnitude quake hit just after 9.30pm and was felt across the region, including Tamworth, Manilla, Gunnedah, Barraba, Tingha, Armidale, Uralla, Inverell and Tambar Springs. In Tamworth it was felt as two sharp tremors, about 30 seconds apart. One resident said the second tremor felt like “something hit the house”. A spokesman for Geoscience Australia told The Leader the quake was 52km north west of Tamworth, near Manilla, 17km under the surface. He said it was caused by movement of rock along a local fault line and it was possible some smaller tremors, or aftershocks, may be felt in the next few days. 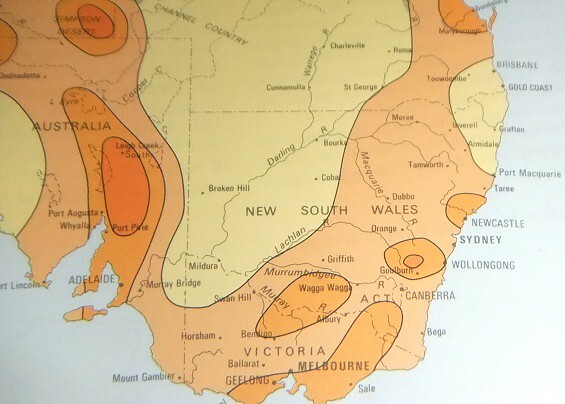 Australia felt these type of quakes “fairly regularly”, he said, but in the past 10 years in NSW there’s only been two earthquakes of last night’s size – one in Cowra and another in Bowral. Police were swamped by hundreds of calls from concerned residents, but there had been no reports of damage or injuries when The Leader went to press last night. It will probably be the lead story on Prime and NBN Local News this evening across the New England - North West. The earthquake was the second news item on Ten News this evening. Something funny has happened to Manilla's earthquake of the 8th of June. The US Geological survey and Geoscience Australia initially agreed that the epicentre was 17 km west of Manilla and 17 km deep. A seismogram from Armidale was published showing a time of 11:31:05 UTC, with another, slightly larger shock two minutes later. This agrees with What Orion copied from Geoscience Australia, and what I observed at Manilla. GA says the earthquake was at 11:32:39 UTC, a time between the two shocks stated earlier - a large error. It says the location is at coordinates that are 30 km west of Manilla (which could be an improved estimate) but that the depth and most other data, including seismograms, are "not available", even though the Solution is "Finalised" as of 12 June. I feel that we ought to be told why the data is "not available". The US Geological Survey is sticking by their analysis, which has been "REVIEWED". However, seismograms are now "not available" although the Armidale seismogram was previously published on this page, as I linked above. The new estimate for position of the earthquake gives a plausible link to a major fault. 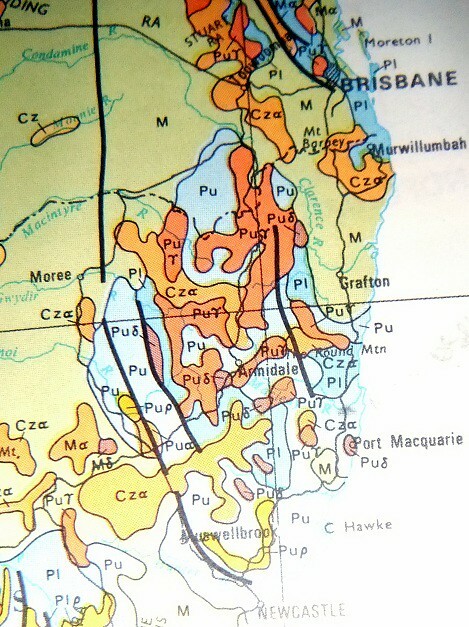 It is only 13 km east of the Hunter-Mooki Fault, also known as the Mooki Thrust (the most western black line on Seabreeze's geological map). That fault plane dips east at about 1 km depth for 2 km horizontally. So a vertical line from the estimated epicentre would meet the fault about 6 or 7 km below. The Mooki Thrust is a very important geological boundary. All our coal is west of the thrust, here in Permian rocks. East of the thrust are older rocks that are more folded. The older rocks have been pushed up over the coal-bearing rocks, and perhaps are still moving up over them today. I don't understand the conventional diagram well enough to know whether the movement in the earthquake was in that sense. No details of this one but I just had a big shake in Melbourne! Yes, what the hell was that??? Felt the 5.2 tremor here in the Belgrave area... I hear according to the Herald Sun it was felt as far away as Tallangatta, I wonder if that means Corryong felt it too? 5 registered (Vinnie, Sidney, Mike Hauber, Timbuck, 1 invisible), 64 Guests and 3 Spiders online. Generated in 0.036 seconds in which 0.012 seconds were spent on a total of 13 queries. Zlib compression disabled.